A Classic Tiramisu becomes an easy made for two Valentine’s Day dessert. A fast and easy dessert that is creamy and delicious. The question is, can we really have too many Tiramisu recipes? And the answer is no, at least that is what the Italian says. And I am proof of that, since Christmas this is the third Tiramisu I have made. I made one for our Christmas dessert and another one for the Italian’s birthday! This Valentine’s Day Classic Tiramisu for Two is the third. The other two, I will post in a few weeks. Just a few ingredients to make Tiramisu. Lady Fingers soaked with coffee. I made the filling egg free although Traditional Tiramisu does have egg in the filling. Italians believe the egg helps give the filling the creamy soft as a cloud texture. 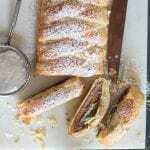 You can also add a little liqueur of choice (such as Marsala, Rum, Coffee Liqueur, Orange, Chocolate or even Irish Cream) in the filling or in the coffee when dipping the lady fingers. With or without alcohol, you decide. Tiramisu can be made 1 to 2 days in advance and should be stored in refrigerator. Definitely refrigerate the Tiramisu Dessert at least 3-4 hours before serving. Any left over Tiramisu should be refrigerated and never leave the dessert out for more than two hours. 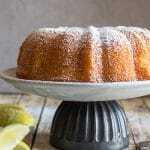 It will keep for up to 4 days in total and leftovers should be refrigerated immediately. Tiramisu can be frozen for up to 3 months. 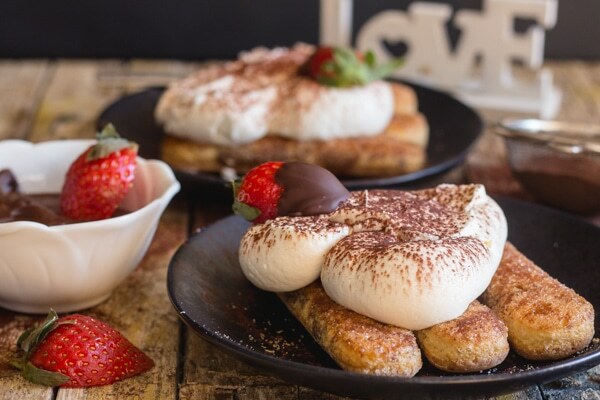 Tiramisu definitely is one of, if not the most popular dessert in Italy, and if you ask a lot of Italians they will certainly tell you the most popular in the world! 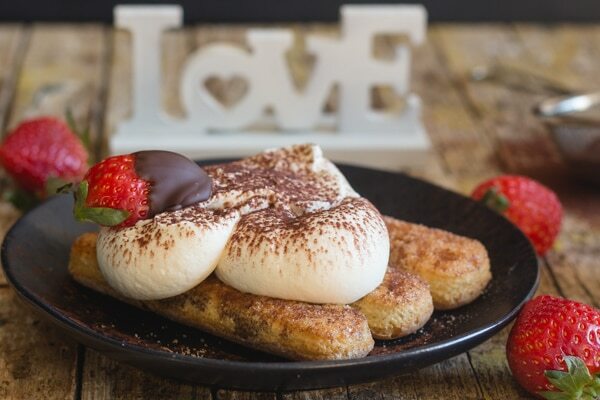 The origin of Tiramisu is often under discussion, some say the restaurant “Alle Beccherie” in Veneto and others the restaurant “Al Camín” in Treviso invented the dessert. 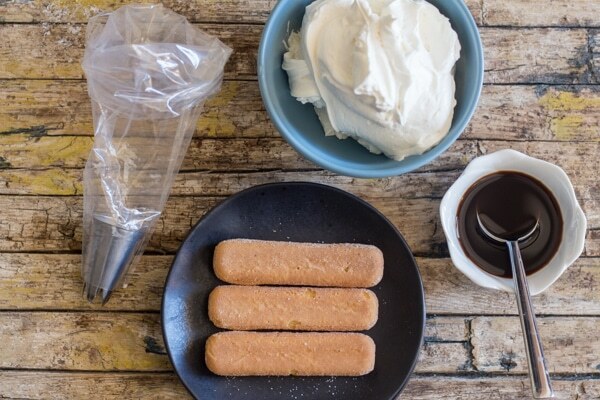 The main ingredients in Tiramisu are Lady Fingers, a strong coffee, usually espresso but it isn’t necessary. You can also use decaffeinated if desired. Mascarpone which is a creamy Italian type of cheese, please do not substitute with cream cheese because then it is no longer Tiramisu! Whole cream, which is cream with at least 30 percent fat. A little bit of powdered sugar and of course unsweetened cocoa powder for sprinkling on the finished dessert. 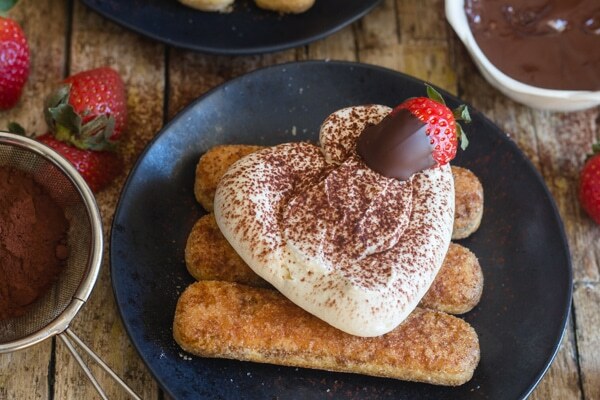 So if you are looking for a quick and easy dessert for Valentine’s Day this year, I think these heart shaped No Bake Tiramisu for Two would be perfect. Enjoy! 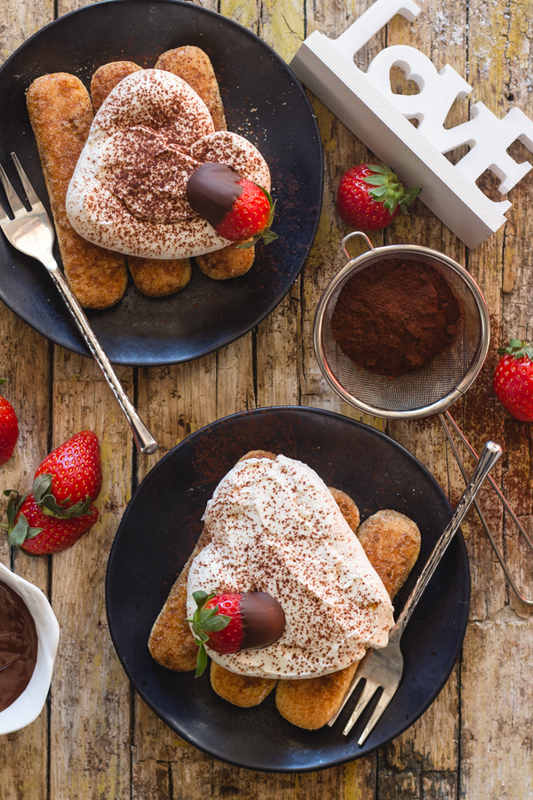 A classic Tiramisu becomes an easy made for two Valentine's Day dessert. A fast and easy dessert that is creamy and delicious. *Remove from the fridge 30 minutes before preparing. In a medium bowl add the cream, mascarpone and powdered sugar, beat on medium / high speed until thickened and creamy. 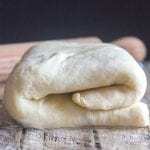 Place in a pastry bag with a large round pastry tip. 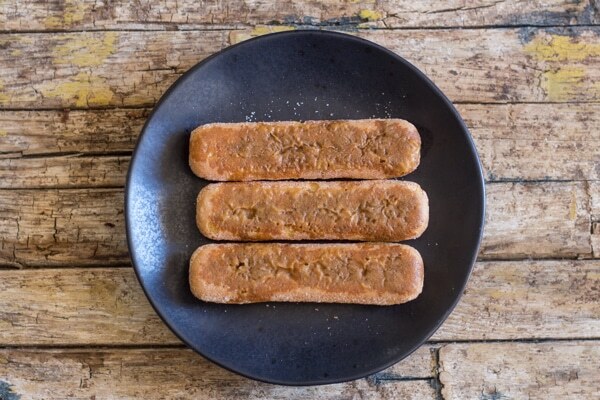 Either dip the Lady Fingers one at a time in a flat bowl containing the coffee or place 3-4 lady fingers (depending on size of cookies) on a plate and spoon the coffee over the cookies. 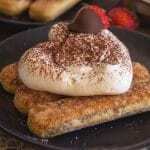 Form a heart with the mascarpone filling on the coffee soaked lady fingers. 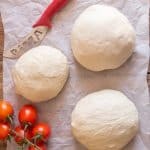 Refrigerate at least 3 hours (can also be made the day before). Sprinkle with cocoa before serving. Decorate with chocolate dipped strawberries if desired. Enjoy! My first attempt made for a a runny mascarpone filling but I put it back in the bowl and used regular beaters (instead of a whisk) and it setup in no time! I couldn’t figure out just how long to soak the lady fingers in the coffee for, what is your recommendation? Hi Christina, just place the cookie in the coffee and flip it over, don’t soak it or the cookie will fall apart. Hope that helps. Oh, Rosemary!! This recipe is a real winner. I love tiramisu, but hate to make it,, because a pan takes me so long to eat, and increases the size of my hips!!! So tiramisu for two is perfect!! Hi Diane, thanks so much. Exactly I could eat a whole pan too, but not a good idea! Have a great day.